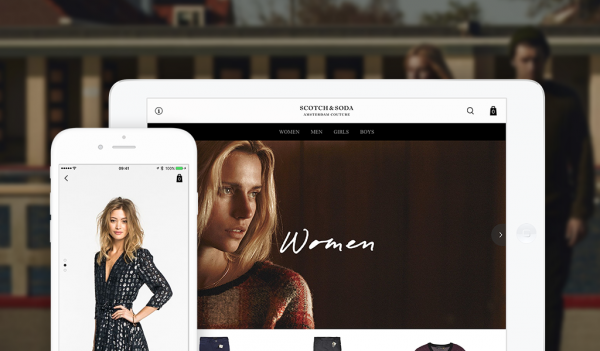 Recently, we launched a new shopping app for Dutch fashion brand Scotch & Soda on the Highstreet retail app platform. Scotch & Soda has retail shops around the world and operates web shops in the US, UK, France, Spain and The Netherlands among others. Right from the launch, the Scotch & Soda app has proven to be very popular with fashion shoppers. The app reached the Dutch shopping app top ten shortly after launch. Besides, the app was featured by Apple in the App store. It’s the first -and hopefully not the last- Highstreet app achieving this. Scotch & Soda chose Highstreet because it allows them to deliver a best in class mobile shopping experience to their most loyal customers. Using the Software as a Service platform, they’re able to offer a high quality unified and device optimized shopping experience across the entire mobile journey. From Apple Watch to iPad Pro and Android. All without the long development and maintenance cycles that are typical for native app development. One of the hallmark features of Highstreet is the lookbook feature. This offers shoppers a seamless way to shop directly from Scotch & Soda’s beautiful fashion shoots. Especially on mobile, where shoppers are shopping from the comfort of their couch, such inspirational experiences make a big difference. This is also proven by research from Highstreet that shows that lookbooks improve customer engagement and sales. Scotch & Soda is the first Demandware client on the Highstreet platform. As Demandware Link Technology Partner, Highstreet offers deep integration with Demandware. This way the Scotch & Soda app is fully integrated with stock, catalog and payment services and provides customers with real-time information at all times. Have a look yourself. The Scotch & Soda app can be downloaded for free in the Apple App Store.